(15 February 2017) This issue will talk more about the shapes of things. The 1 March issue will capsize a Normsboat for real! Paddling Normsboat out to race but it turned out to be a capsize! Read about it next issue. ... have long skinny wings. Essentially the long skinny wings are more efficient from a flying standpoint (not from a structural standpoint). The reason is that the pressure on the bottom of the wing is in general higher than that on the top, thus "lift" is produced. The pressure difference causes the air at the wingtips to flow from bottom to top as it moves aft, thus it swirls around there. The air movement there is seen (at least in subsonic flow, not too sure about supersonic flow) as a general "downwash" over the entire wing, the net effect is that the wing sees a lot less "angle of attack" into the wind than you might expect. Now imagine these two are sailing together in the same wind, close hauled to sail as close to the wind as possible. Both sail and keel are brought to just below the stalling point while they do so. 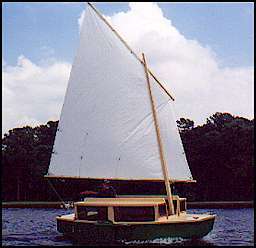 The skipper will note that if he tries to point any closer to the wind with his sail that it starts to "luff", that is the leading edges start to flutter and his sail power is reduced. At the same time he might watch his wake and note that his keel has not stalled and he is not making too much leeway. Both boats are the same except that the sail and keel aspect ratios are different. Now imagine you are on one of the boats and the wind shifts slightly to the bow causing the sail to luff. The skipper must bear off a bit to compensate and keep the sail drawing fully. Now imagine instead that this "wind shift" is actually the sail's own downwash. 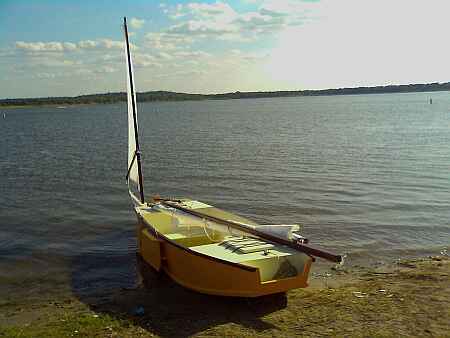 So you see that the sail's own downwash directly decreases the boat's abiltity to point into the wind. Now let's hang some numbers on these two boats. The aero gurus say the shift of the wind due to downwash, in degrees, is a=18 x Cl / AR where Cl is the "lift coefficient" and AR is the aspect ratio. (Actually they have lots of correction factors for this equation given different wing shapes.) A thin cambered airfoil like a sail will have a maximum Cl of about 1.5 and I'll use that for this case of sailing close hauled. So it works out that the low aspect ratio sail will have an "induced angle" of 12 degrees while the high aspect sail will have an induced angle of about 7 degrees. All other things equal the high aspect ratio sail should point about 5 degrees closer to the wind simply because it has less downwash. And I suppose the history of racing boats in particular is to go higher and thinner with sails. But there are limits, especially for us non racers. First of all nobody wants to make, haul and rig a mast that extends to infinity. The racers might put up with that but even then there is another serious problem with tall thin rigs. They are apt to twist more than low wide sails. After all it is just fabric and string, unlike the aircraft which use their hard skins to form efficient torque boxes to resist twist. Some sailors have tried hard skin wings, some actually rigging an aircraft wing as a sail. But tell me how are you gonna reef it? And even aircraft are eventually limited by their structure in the aspect ratio department. So first we have the basic sail close hauled at about 15 degrees from the wind (I'm guessing at all of these angles). It produces on the sail a total force which can be shown as the vector sum of lift (perpendicular to the airfoil), and drag (parallel to the airfoil). I'm guessing again but if the sail's general Lift/Drag is 10 then the total force will tilt back about 5 degrees from the basic angle of attack. So the total vector slats back at 110 degrees from the wind direction. Next we add a bit of downwash effect where the skipper needs to tilt the sail another 5 degrees (for example but the earlier study shows it is a bit larger) so the sails main vector tilts back 115 degrees from the wind. Finally let's simplify the picture by just looking at the resulting sail force. This is what is moving your boat when close hauled. Think of it as a rope pulling on the mast sort of like what tow path mules used to do as they pulled a canal boat down a canal. I've been writing like a true mystery novelist who keeps the best until last (unlike a good techincal writer who puts the best in the first sentence because he knows no one reads past the first line). I suppose the real reason I wrote this article is to show a reason why you can't just use really shallow keels without special considerations. First view is just the basic sail force as before. Next we add a boat hull perpendicular to that force shown at 25deg to the wind by all my angle guesswork. So, you think, the boat can't possibly sail closer to the wind than that since now all the force is to the side. So the skipper tilts his boat slightly downwind, say another 10 degree guess, to get part of that total sail force to push him forward. The major portion of the sail force is still pushing him sideways but we'll worry about that later. At least we are moving somewhat forward. Now he is 35 degrees to the wind and I'm thinking that is about as close as any reasonable sailboat might point into the wind. So the really important job here for the keel is to counteract all that side force. So the skipper always has to aim his hull to windward of his desired course and he might think of that as leeway. Another way to look at it is in the above example he is trying to point 35 degrees from the wind and he aims it that way, but the boat's track will be 10 degrees downwind of that because of the leeway. So he is tracking 45 degrees to the wind close hauled. Mind you his hull is pointing 35 degrees to the wind but it isn't going where it is pointing due to mandatory leeway. ...the keel also lives in a fluid and is subject to downwash! So the leeway is worse than just the basic "angle of attack", just like with the sail. 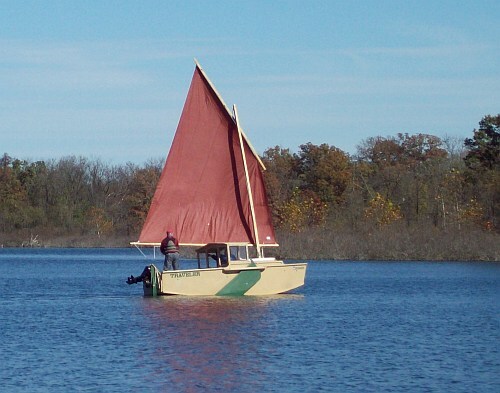 There is another difference with the keel in that there will be no spillage of the water around the top where it meets the hull (assuming no gap there or with a leeboard the water can't flow over the top of the leeboard). So in effect it is half a wing as far as downwash is concerned and the aero guys say this effect doubles its aspect ratio as far as figures are concerned. So in the example above the low rig has an effective keel aspect ratio of .5 and the high rig an effective keel aspect ratio of 8. Let's run the induced angle numbers for the lwo examples using a Cl=1.0. For the high aspect ratio rig it calculates to be just 2 degrees. (I wouldn't notice that myself.) And for the low aspect rig it figures out to be a whopping 36 degrees! It sounds extreme and I don't know if I really believe it but I can say for sure that if you raise the leeboard on a close hauled boat you will find you aren't moving to windward anymore. I know some boats have things like keel runners and such. I've never tried them and can only say they aren't very effective by these theories. Full keeled boats of low aspect ratio have been around a long time, a lot longer than deep finned boats. They can work because they can have a huge side area, thus operate at low values of Cl all the time. The penalty of the shallow keel is clear but, you know what?. Some will look at the low aspect keel and ask, "Can I make the keel just 6" deep?" And so forth. IMB features a "Birdwatcher" cabin, full length with panoramic windows and a center walkway slot in the roof. Everyone rides inside. 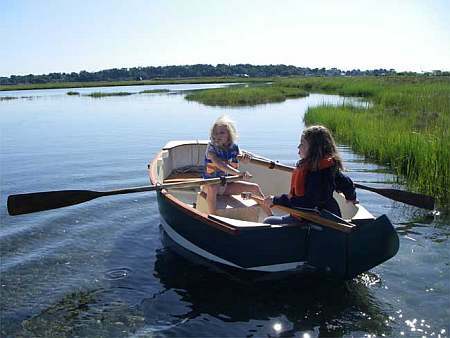 This style of boat was invented by Phil Bolger in the early 1980's. 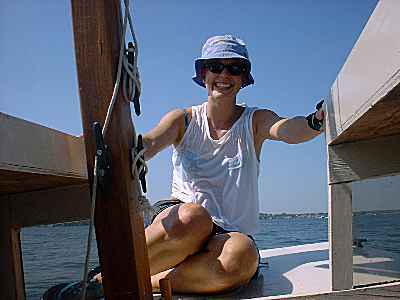 These boats can be self righting with minimal, or no, ballast because crew weight works as ballast. They sit low looking out through the windows (although standing in normal winds is quite acceptable). The cabin sides provide lots of buoyancy up high to ensure a good range of stability. IMB, which is small with a light bottom, should reliably self right from 60 or 70 degrees and in the test described above self righted from a full 90 degrees of roll. 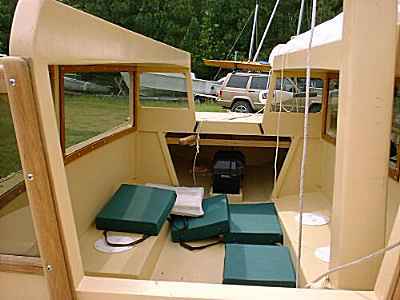 These boats are operated from within the cabin, like an automobile. No one need ever go on deck. For boating with children I can see no equal. 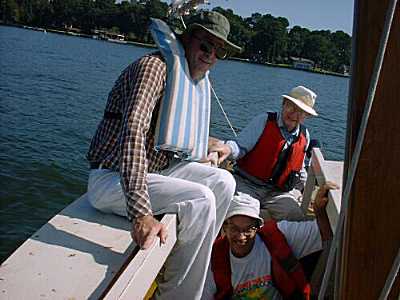 IMB has an 8' long cabin on a multichine pram hull. The prototype was built to perfection by Gerry Scott of Cleveland, Texas. At the Conroe (Houston) messabout I got a chance to look over his boat plus the only other IMB I know of built by Bob Williams. Both boats were quite true to the plans. Both had added low inside seats which made them more pleasant to use to the point that I will show some seats on the plans. I was worried when I drew IMB that the headroom would be minimal so drew no seats thinking the crew would sit on the floor, as with the original Birdwatcher. While I was sailing with Gerry, Bob's boat came out on the lake with four adult males and no sign of bogging down, showing that these fat pram shapes, very much like my Piccup Pram, can handle a lot of weight in the 13.5' length. I don't know if either boat had ever been weighed and the 350 pounds I quote as the empty weight is just a guess. One of the ideas behind the boat was that it might be towed behind a compact car and I was glad to see that Gerry tows his behind a 1500cc mini SUV. Both men adjusted well to the lug sail/leeboard rig. 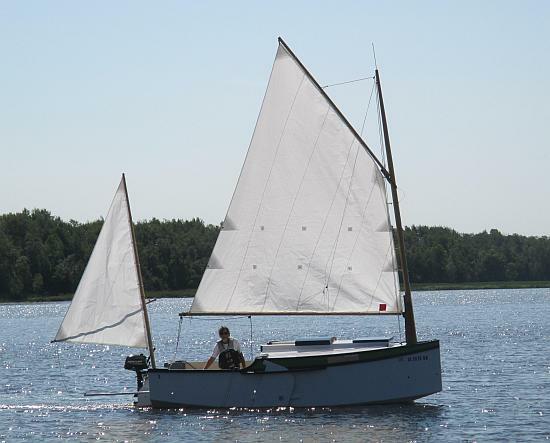 Gerry's has the blueprint 104 square foot sail and Bob's uses the 114 square foot Bolger Windsprint sail available from Payson. I used to worry a bit about running a leeboard on a full cabin boat like this since handling must be done by remote control, so to speak. No problem. Both boats have the leeboard lanyard running to a cleat on the aft deck. The leeboard position is plainly in view at all times through the cabin window. In use these leeboards need only lanyards to pull them down. Once down they will usually stay down until they strike something. Then they pop up and you will need to pull them down again. I've never seen a need for a lanyard to pull the board up although I've seen several rigged that way. The Dovekie design had elaborate cam operated levers in the cabin that operated the leeboards and I thought that all very clever. But in talking to some Dovekie owners I found the internal levers are not universally loved since they can often be in the way. Anyway, my idea was not to run the down lanyard to the aft deck but rather through a small hole in the side of the boat, say 1/2" for a 1/4" lanyard, so it could be operated totally from inside the cabin. Both Gerry's and Bob's boats used electric trolling motors. 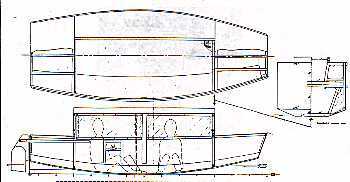 The plans show rowing ports and no provisions for a motor. 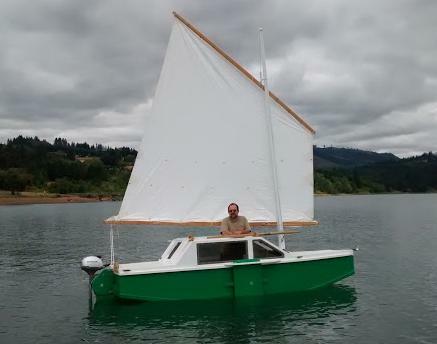 A boat like this won't be a fast row boat but it might be useful in a calm. 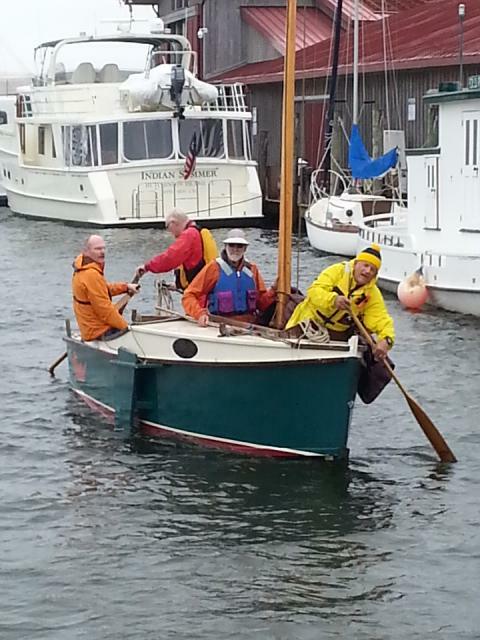 Even the 24' Birdwatcher would row about 2.5mph in a calm. But I'll admit that adding a motor to Birdwatcher makes it a much more useful thing. IMB takes two sheets of 1/2" plywood, eight sheets of 1/4" plywood and one sheet of 3/16" Plexiglass. Taped seam construction using no jigs or lofting.